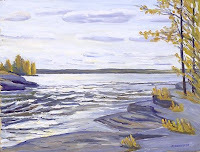 Click on the paintings for more details and to see it in a larger format. Artists are listed alphabetically. John is an Ottawa River Institute member and director. He divides his time between Westboro in Ottawa and Lake Clear in Renfrew County. He paints for personal enjoyment, sketching scenes of our natural heritage in their actual settings. 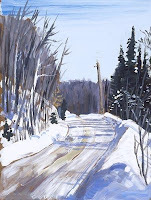 Medium is mainly in oils but in the cold days of winter pastels are the means. 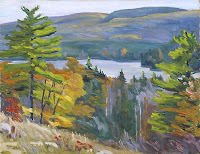 Has painted for over 40 years, strongly influenced by his friend Ralph Burton who painted for many years with A.Y. Jackson. John has kindly donated these paintings to ORI for fundraising purposes. The originals are for sale as are same size, archival quality prints on cotton rag paper. John is an ORI member and an advisor to the ORI Board. He has been painting since he was a small child. A life in balance, with time for expression, for family and community, and for developing peace in the heart, everyone’s hearts, is really what I am attempting to achieve, and if the pictures displayed here help to move towards this end then I have been successful." Archival quality prints on cotton rag paper are available for each of these paintings. The original of Laurentian Road is also for sale. John Bateson A. O. C. A. "My father also did a fair bit of drawing, mostly pen and ink, and I also recall him sitting with me and showing me such things as how to draw a box so it appeared three dimensional.I enjoyed art in school for the most part, especially when left to my own devices, and I took several evening life drawing classes, along with my mother, and took various fine art courses at Algonquin College in Ottawa, but ended up a few credits short of a diploma. However, this was my first exposure to the world of professional artists, and I enjoyed the whole experience and learned quite a bit. I began to be more experimental while in this milieu, as this was encouraged. I did a lot of palette-knife oil paintings, some of which I’m still quite fond of, and I learned various new techniques, most notably screen printing. I went on to become proficient in this discipline and worked in industry doing among other things, display work for the National Museums of Canada. This work involved the use of a lot of toxic substances and provided little room for creative input, so I contemplated a return to school. I was fortunate enough to be accepted at the Ontario College of Art (now called the Ontario College of Art and Design). Toronto, where I ended up spending the next ten years. I worked as a commercial illustrator after graduating. Eventually I found that commercial art was a bit on the stressful side and again, often with not a lot of room for creative input.I had begun to draw and paint as a child as a way to communicate and as an effective means of putting down thoughts and feelings about things, a way to bring internal images out to be seen and shared. I suppose the past fourteen years have led me inexorably back to this path. I still do the occasional commercial job, but prefer to do the sort of work you see here. A life in balance, with time for expression, for family and community, and for developing peace in the heart, everyone’s hearts, is really what I am attempting to achieve, and if the pictures displayed here help to move towards this end then I have been successful.I hope you enjoy these pictures! May your blessings increase…" John Bateson. 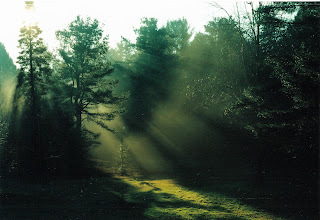 As an exhibiting artist, I have been showing and selling my work since 1986. 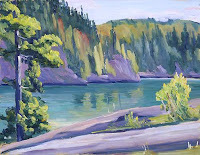 Living in Pembroke, an area of scenic beauty, makes me a painter who is inspired by the colours, forms and diversity of nature. 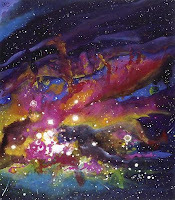 My paintings are done in watercolour, oils and acrylics. 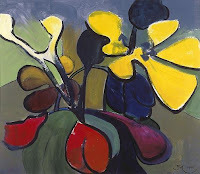 They are landscape, heritage farms, abstracts and floral. Until my retirement, I was employed at the former Pembroke Civic Hospital. Holiday time was often used to attend painting workshops and classes. These opportunities have taken me to Banff, Hawaii, Arizona, Killarney, Ottawa, North Bay and Haliburton. John is an Ottawa River Institute member from Pembroke. He is an artist and an art teacher. John says his art is chiefly about his passionate and spiritual response to life: nature and the human condition. Archival quality prints of these paintings are available to be purchased. Jordan is a native of Pembroke, Ontario. "I do most of my field work in and around Algonquin Park and the tributaries of the Ottawa River watershed (Petawawa, Nipissing, Madawaska, Barron and Bonnechere). I work on location and I don't use photography as a reference aid. I try to take the things I've learned from these smaller works and develop larger format pieces that are more conceptual in nature." Trying to capture an elusive essence in the process of dabbling in watercolours though colour, shape and rhythm is a source of joy for me. 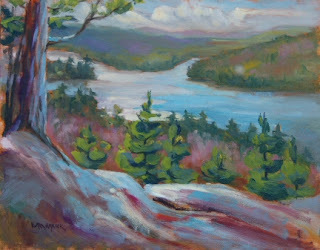 My paintings evolve from the shorelines, vistas and tangled forests of my own life journey. I have the good fortune of living on the river and spending my days teaching (and being taught) as a high school art teacher in Pembroke. 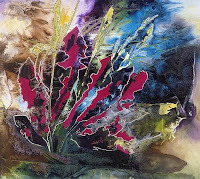 Through my work I understand how rich and varied art- making can be for all of us and how marvelous this process is. 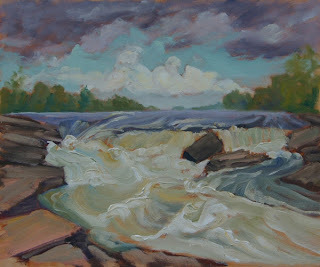 The arts open a door into seeing what we have so we can cherish the beauty that surrounds us - and if that door is opened wide enough we will strive to protect that life-giving gift of river and sky.